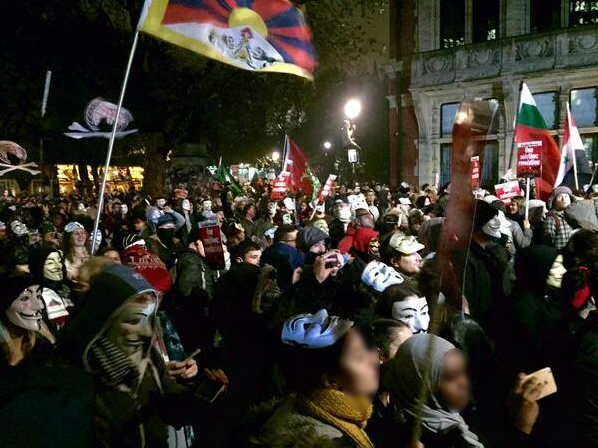 Awesome to see the Tibetan flag raised during the November 5th mass rally by Anonymous in London, as thousands of folk marched through the city protesting against a whole range of issues. 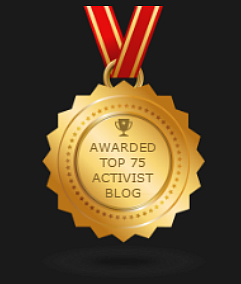 Many thanks to Druantia Spiorad @AnonymousTibet @team_riddler for sharing news and images. 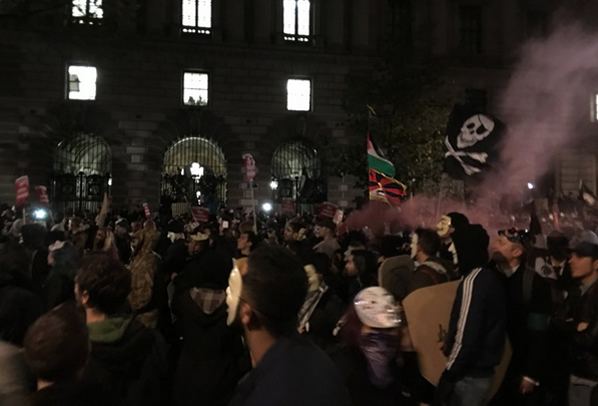 Anyone else checkout via the internet the scenes on London sidewalks yesterday as the British Establishment groveled to China’s President Xi Jinping. The route taken by his cavalcade was swamped with an army of adoring supporters, all carrying that symbol of human rights, compassion and freedom, the Chinese national flag! The dissenting protesters, Tibetans, Uyghurs, members of Falun Gong were overwhelmed, caged in by the cops, and it would seem denied certain actions, which pro-China activists appeared to enjoy without restriction. Looking at events there it was obvious this was no impromptu outpouring of adoration towards the Chinese leader but a carefully staged and well funded effort to effectively dominate and suppress any attempt to raise issues such as Tibet and human rights concerns. Behind the cheery smiles of the army of Chinese supporters, all wearing pro-China branded clothing was an agenda to propagandize, manipulate and take control of any media coverage. The game was busted by a BBC crew who discovered boxes of such merchandise that had been shipped in from China, as shown in the video above. Meanwhile the UK authorities, who have decided to jump into bed with China’s regime in exchange for profit, looked to have extended advantages and concessions to these loyal Chinese ‘supporters’ which are being denied to Tibetans and others protesting against the visit of President Xi Jinping. 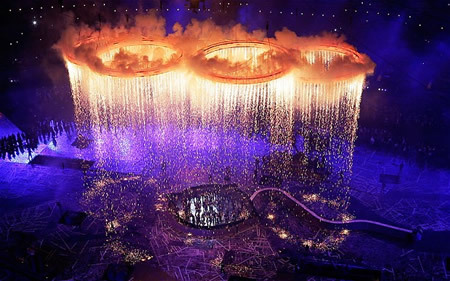 During the London Olympic Ceremony as the athletes of Bhutan entered the arena, the BBC commentator declared that the Himalayan country bordered China. A similar description was given to Kyrgyzstan, when in truth that land has occupied East Turkestan on its eastern border. Always willing to promote China’s propaganda line and indifferent to the facts. it mattered little to the narrators that Bhutan is next door to occupied Tibet. Such moments remind us of the ideological war which China wages concerning its bogus claims over peoples and territories which it invaded and illegally occupies and the servile collaboration of media. Watching the parade of nations, including a Palestinian delegation, there was a sadness that Tibet was not represented relieved though by a moment of pleasure wondering what sports it would excel at, archery and wrestling spring immediately to mind, as traditional games enjoyed by Tibetans. Can you imagine the reception of the crowd on seeing Tibetan athletes, dressed in the fabulous colors and costumes of Tibet’s regions. 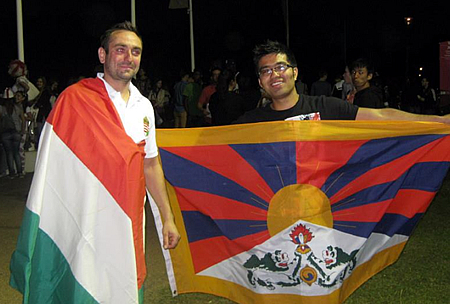 The smiles and applause as the Snow Lion banner made its way into the arena, to take its rightful place among others national flags, it would be magical. 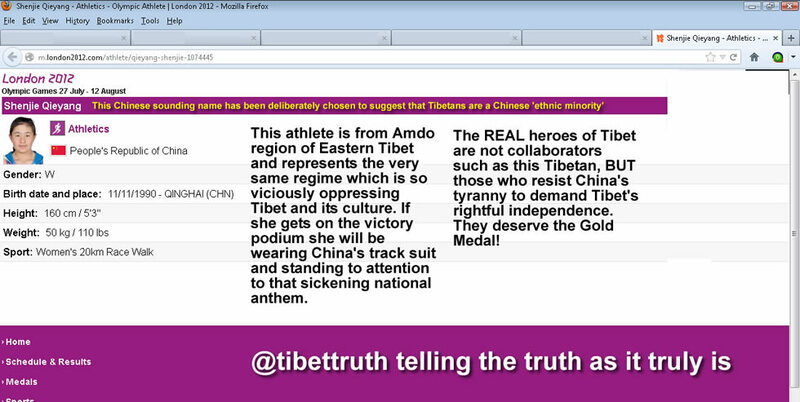 Meanwhile, as activists voyage to the creative parts of their thinking to conceive ways to get the Tibetan flag past the layers of insane security (which pervades every aspect of the London Olympics) in order to remind the global audience of the national freedom denied to Tibet, that dream retains a powerful ability to inspire, despite China’s tyranny and propaganda. Such hopes can be realized, who for example would have thought it realistic, that a number of participating states in the opening ceremony, formerly denied their national independence by virtue of being part of the former Soviet ‘Union’ would realize their freedom and be a member of the Olympic community of nations? Yet there they were Armenia, Azerbaijan, Belarus, Estonia, Kazakhstan, Kyrgyzstan, Lithuania and Ukraine all enjoying the celebration and atmosphere under their respective flags. 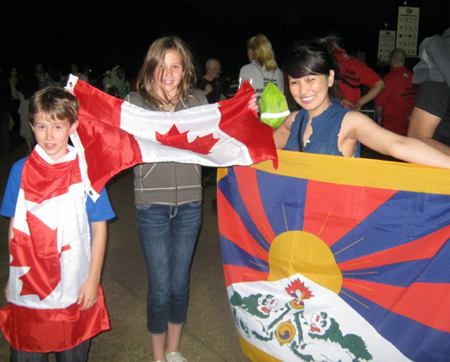 The one national participant of particular interest and relevance to Tibet and its struggle is perhaps East Timor and when its athletes paraded around the stadium it was as a beacon of hope that one future occasion Tibetans too will enjoy that right and freedom. There are some important parallels between Tibet’s cause and East Timor’s struggle, most prominently a people declared their independence only to have their land invaded leading to a struggle to regain sovereignty from a dominant occupying power. Shared too was a range of injustice and suffering imposed by a foreign regime that was immensely advantaged in terms of economics and military supremacy and resources. Tibetans inside occupied Tibet experience a similar if not more vicious tyranny and have the same objectives as that attained by East Timor, which was to gain its independence in 2002. Important to note however that this was realized with far more active political support, significantly via the United Nations and the Roman Catholic lobby, than Tibet enjoys, indeed it has been asked had East Timor been a non-violent Buddhist culture would its cause have attracted the international solidarity it did. The role played by the United Nations in assisting to secure and facilitate independence for the East Timorese naturally begs the question why is it so sloth-like in supporting the Tibetan people, one key factor is of course the political magnitude and influence of China as a Security Council member within the UN, a power not enjoyed by Indonesia which eventually had to conceded to international pressure on East Timor. Yet while such real politic should not be underestimated the mechanisms and process in which the UN encouraged and supported the path to East Timor’s national freedom may well offer a more hopeful alternative objective for the Tibetan cause than accepting Chinese rule and tolerating minor improvements in autonomy, yet firmly under the grip of China. The primary reason for UN intervention was built upon the degree and extent of violence, denial of human rights and cultural oppression which in 1974 followed Portugal’s abandonment of its colony of East Timor. A civil war erupted between various parties until the unilateral declaration of independence Ion November 28, 1975. Backed by western governments and anxious of supposed communist influence the Indonesian military invaded during December 1975 and announced East Timor as its 27th province on July 17, 1976. Critical to note that, unlike the occasion of China’s invasion of Tibet in 1950, the UN Security Council opposed the invasion and East Timor’s nominal UN status remained “non-self-governing territory under Portuguese administration.” It is a tragedy and example of the cynical indifference of powers at that time that Tibet’s fate was not afforded a similar sympathy and support. The years of Indonesia’s occupation of East Timor was characterized by violence and brutality, with a reported 102,800 conflict-related deaths in the period 1974–1999, during which the East Timorese guerrilla force, Falintil, fought a bloody campaign against the Indonesian forces. Then in 1991 the 1991 Dili Massacre was to attract international outrage and wider support for the independence movement. Upon the resignation of Indonesian President Suharto, a UN-endorsed arrangement between Indonesia and Portugal authorized a United Nations supervised popular referendum in August 1999. The result massively chose independence, which was responded to by further military action from Indonesia and its supporters within East Timor, leading to An Australian peace-keeping mission. The administration of the region was assumed by the UN through the United Nations Transitional Administration in East Timor in October 1999. East Timorese independence was formalized on May 20, 2002 and on September 27, 2002 it became a member of the United Nations. continues to remind the world that a people can, with determination and resistance overcome a foreign tyranny, despite overwhelming military power. However, it remains debatable if East Timor would have been able to free itself from the shackles of occupation without the international support and UN intervention it eventually received. Currently Tibetans are largely ignored by the United Nations, at best they receive platitudes, or empty assurances are offered as was the response earlier this year to the Tibetan Hunger Strike outside UN Headquarters in New York. That indifference demands to be challenged and the United Nations reminded, through a forceful and unified campaign, of the catalog of human rights violations, cultural genocide and violent oppression endured by Tibet’s people for over six decades. Ban Ki Moon who was a member of the team tasked with escorting the Olympic flag during the ceremony has to consider that his organization, which actively supported East Timor’s journey to freedom has a moral and ethical duty not to ignore the plight of Tibet or rightful aspirations of its people to regain their independence. 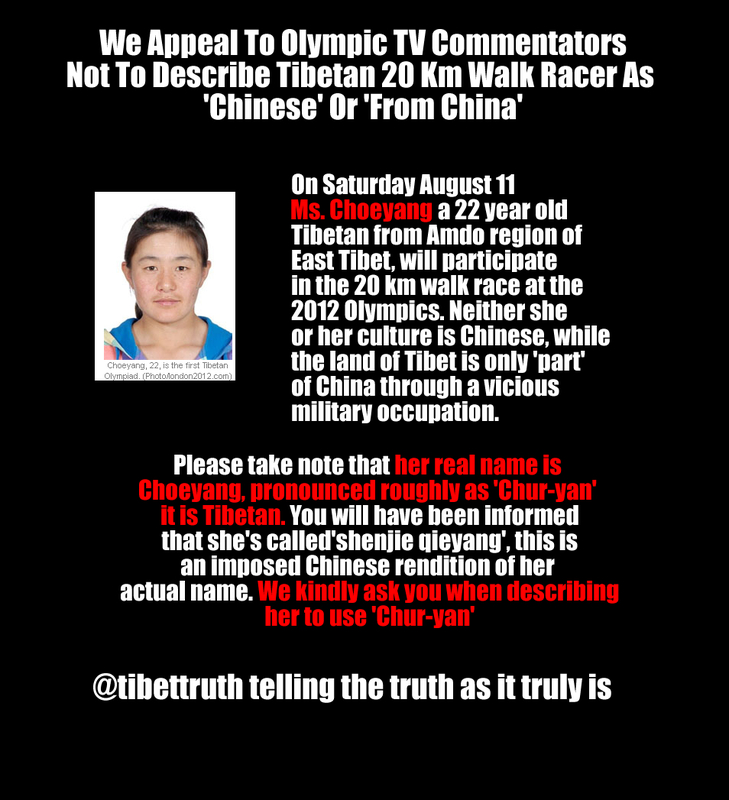 The Olympic ideal claims to represent the highest human values and principles, as does its sister organization the UN, however while Tibetans remain in chains such principles are cosmetic posturing. Can we expect anything more from such a morally bankrupt organization which in May authorized the deployment of Chinese police officers as part of the United Nations Peacekeeping Force in East Timor!